Songs for My Mother CD features a song cycle with texts by my mother, Miriam L. Weaver, derived from her journals, ranging from her early days in the 1940s in Appalachian Kentucky, to moments before her untimely death. The sense of her working in primitive physical settings and creating home, friendships, and community are, themselves, a saga. Her accounts of Hard Shell Baptist practices are as vivid and cogent as those of any ethnomusicologist! Feedsack Curtains, Flat Iron and Hard Shell Baptists recount these early years. Lately Sprung rejoices at the birth of her only granddaughter. Crossing Over and To the End, words spoken right before she died, present chillingly honest looks into a death about to occur, but with a hue of hope. African Wilderness contains three wordless songs – Soaring Batteleur Eagle, Leaping Impala, and African Night – overlaid with soundscapes recorded by Carol from wilderness areas of Kruger and Imfolozi, South Africa. In Our Planet, the songs Grant us Peace, Sea and Sand, Rising, (text by CAW), and Blue Green Planet (text by Winnipeg poet, John Weier), laud our amazing earth home which we share with all other living beings. 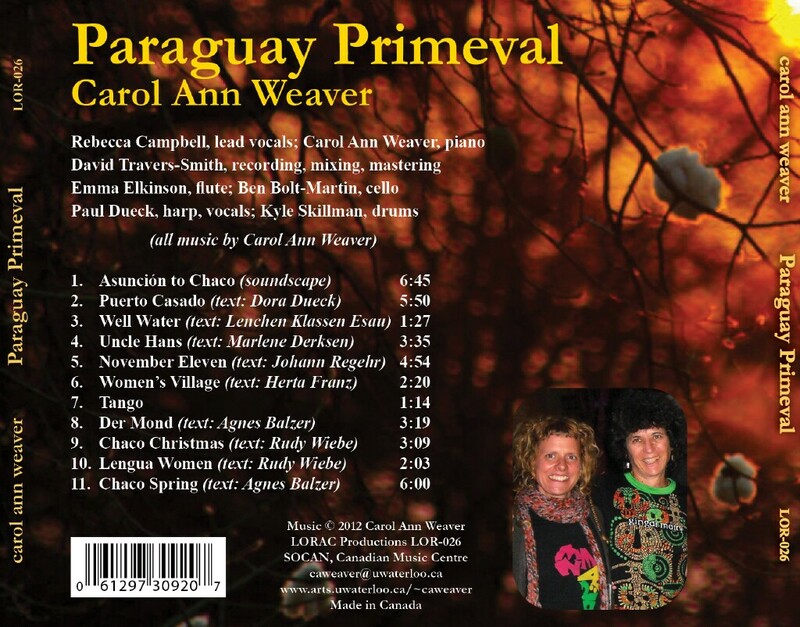 Vocalist Mary-Catherine Pazzano joins Carol Ann Weaver (piano), Willem Moolenbeek (saxophones), Ben Bolt-Martin (cello), Andrew Chung (violin), and Jana Skarecky (didgeridoo), as recorded/mixed/mastered by Earl McCluskie of Chestnut Hall, Cambridge, Ontario. 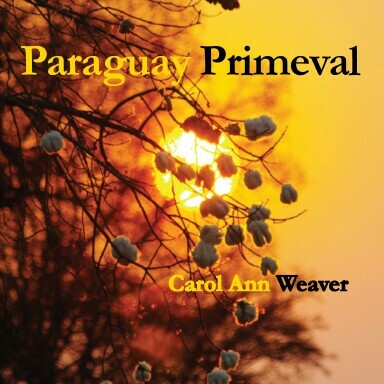 This music by Carol stems from a recent trip to Paraguay, and an ongoing collection of stories about these remarkable Mennonite settlers who found new “Promised Land” in the Chaco. Moving there in 1920s from Western Canada, later joined by those fleeing Stalinist Russia, these Mennonite settlers eventually changed a “Green Hell” into a thriving “Green Heaven,” luring back many indigenous people to this arid, challenging landscape. The work bristles with jazz riffs, a tango (in case they may have danced in spite of themselves! ), a lament for one family which died from typhus, a song for the women’s village, a humourous song about the lithe indigenous women, a song for Uncle Hans who survived being lowered into a well, and more. Texts are derived from works by Rudy Wiebe (Blue Mountains of China), Dora Dueck (Under the Still Standing Sun), and Schonebrunn Chronicles translated from original Paraguayan colonists’ writings by Henry and Esther Regehr. (CD Cover photo by Hans Hildebrandt). Proceeds from sales will go to MCC work among indigenous people in the Chaco, Paraguay. 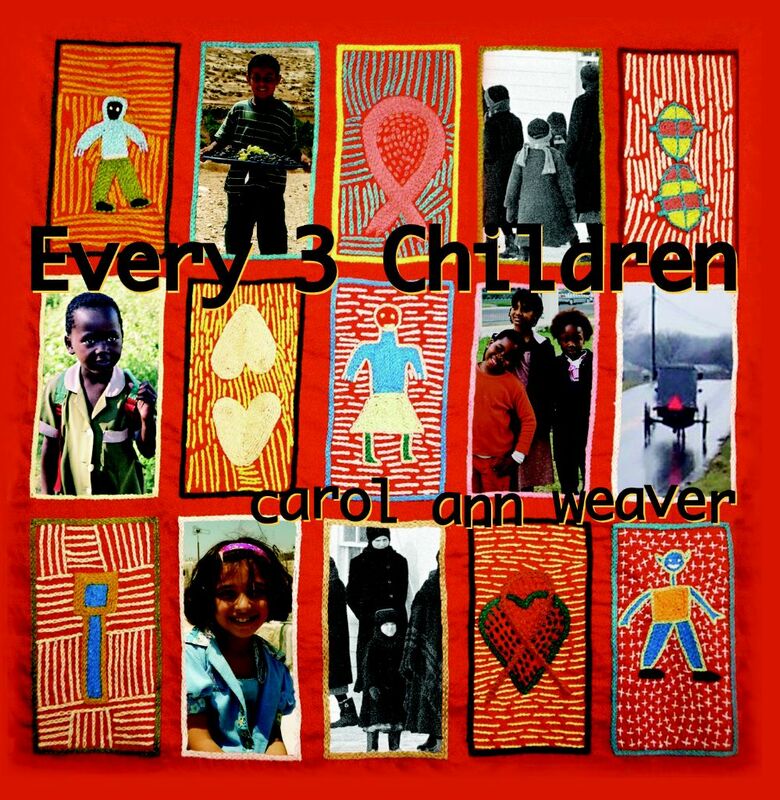 Carol Ann Weaver’s 2008 CD, EVERY 3 CHILDREN (vocals by Rebecca Campbell), features Carol’s song, “Every Three Children”, composed for African children affected by AIDS as well as “Lobsang” for the five Amish girls. Proceeds from each sale of Every 3 Children will go towards AIDS relief (via MCC and Stephen Lewis Foundation) and the Amish Recovery Fund (MCC) and African. Brilliantly recorded/engineered by Juno-nominated David Travers-Smith, the CD is graced by evocative Canadian vocalist Rebecca Campbell, jazz/classical pianist by Carol, with sweet guitar by leading South African guitarist Mageshen Naidoo, lyric cello by Ben Bolt-Martin, world beat drumming by Mark Duggan, haunting flute by Emma Elkinson, and heart-felt, grounding choral work by Leonard Enns’ Conrad Grebel Chapel Choir. 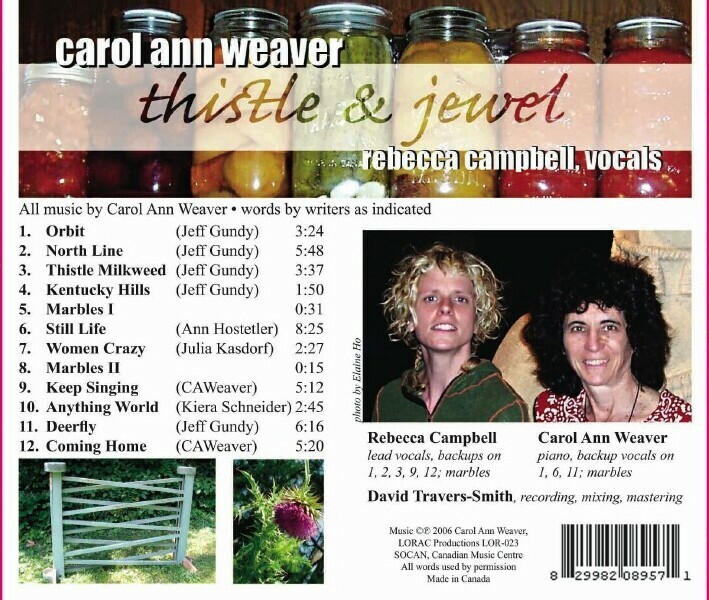 THISTLE & JEWEL, 2006, is a collection of Carol’s songs based on poetry of Mennonite-rooted poets – Americans Julia Kasdorf, Jeff Gundy, Ann Hostetler, and the young Canadian Kiera Schneider. Sometimes our own stories are hardest to tell, our own songs hardest to sing – both the thistles and the jewels. But these writers playfully, whimsically, and colourfully transform normal days into miracles, ordinary farm landscapes into visionary places, modest housewives into frenetically crazy cooks, and plain Amish houses into raucous marble-roller arcades. Respectfully and sometimes irreverently, the songs deal with the humour, piety, earthiness, work-and-play, aspirations, wonder, imagination and beauty found within this unique cultural setting. The music joyfully incorporates sounds from a shared cultural Mennonite heritage – the quietness and space, the urgent busyness, the make-believe worlds created by children sitting through long Sunday morning sermons. And somehow vocalist Rebecca Campbell (never of Mennonite background!) matches each nuance, breathing resplendent and rollicking life into this music! 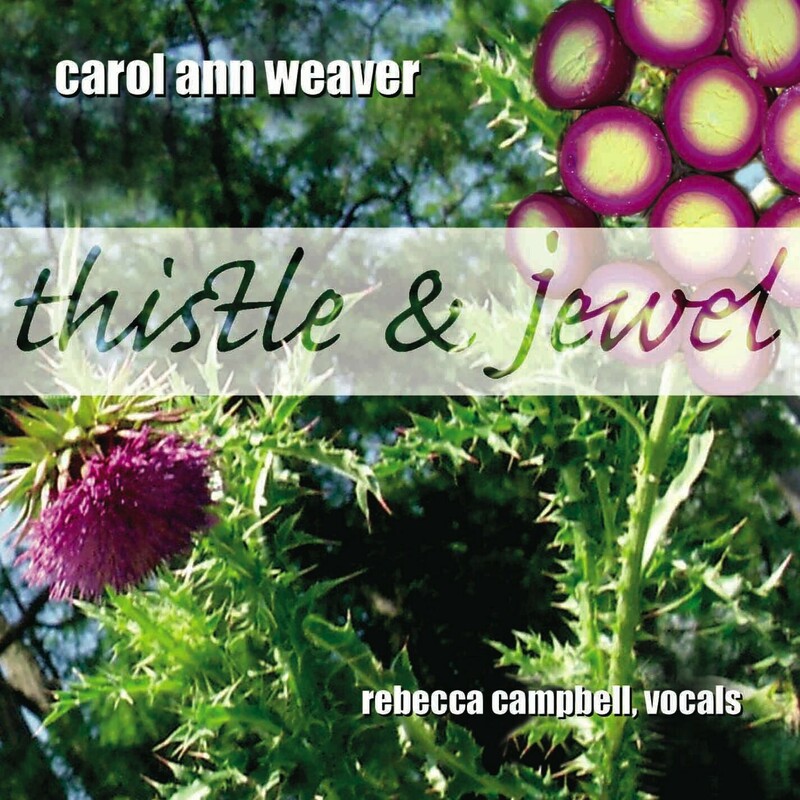 Thistle & Jewel — Rebecca Campbell, vocals; Carol Ann Weaver, piano and several backing vocals; David Travers-Smith recording engineer/artistic consultant, co-produced by Carol, Rebecca and David, recorded at Conrad Grebel Chapel, Waterloo, ON, and at Found Sound Studios, Toronto, ON, June, July, 2006. 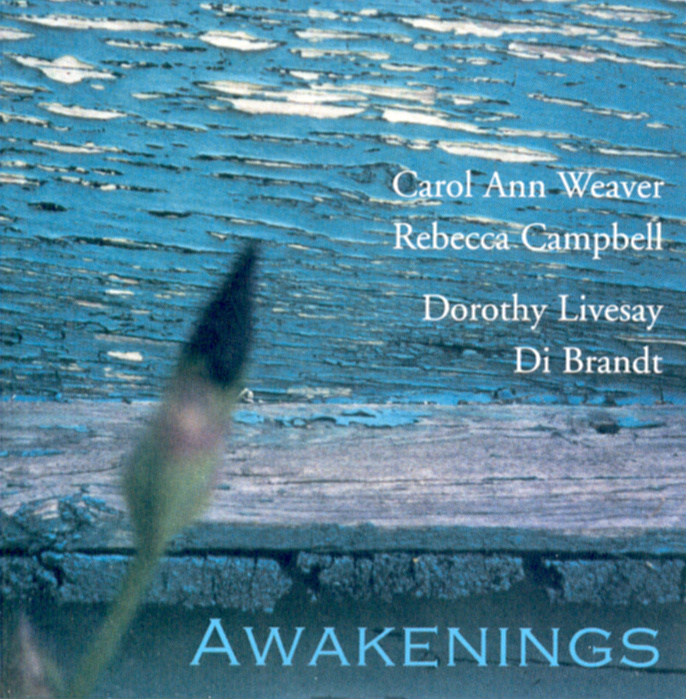 AWAKENINGS is four-way collaboration of composer/performers Carol Ann Weaver and Rebecca Campbell, based on poetry of Di Brandt and Dorothy Livesay. The work stems from Livesay’s 1991 limited-edition publication, “Awakenings”, written late in her life, on which Brandt wrote her own poetry, “Waking Up”, 2001. The combined poetry leads listeners down rare paths of transition between life and death. Coming from varied musical traditions and styles, the music ranges from folk to avant garde, jazz to soundscapes, groove to meditative, creating an interwoven musical/poetic web. The CD, AWAKENINGS, features vocalist Rebecca Campbell, pianist Carol Ann Weaver, guest vocalists Jane Siberry, Mia Sheard, and Jennifer Moore, and guest mandolinist Lyle Friesen, recorded, mixed, mastered by David Travers-Smith, produced by Rebecca Campbell. Reviewers have commented on the power and seamlessness of AWAKENINGS, and have described the work as an “uncanny bridge between life and the beyond.” MUSICWORKS described this work as “an artful melange of words, music, styles, and expression that sits on the edge of definition.” One listener says, “Your spirit can change the world”, and many listeners rave about Rebecca and Carol’s respective performing/composing styles which dovetail in intimate and essential ways, creating a unique continuity, and a new sound within today’s music. DANCNG RIVERS – from South Africa to Canada, 2001, was recorded in South Africa, 2000 with outstanding South African jazz artists Natalie Rungan, Mageshen Naidoo, Bongani Sokhela, Thandeka Mazibuko, Lebohang Methebeng, Jeff Robinson, Maggi Deppe, with Carol Ann Weaver as pianist, and was completed in Toronto, Canada, with additional vocals by Rebecca Campbell, drums by Jean Martin, produced by John Gzowski. The music sparkles with African flavours, jazz fusions touches, the bustle of Durban, and the sounds of silence from South Africa’s Kalahari desert and Kruger wilderness. Carol Ann’s earlier song, “Dancing Dancing River” reappears here in a vivid, upbeat, blues-gospel style. JOURNEY BEGUN is a musical “genre-bender,” bringing together a folk/blusey singer, funk/classical pianist, groove/new music guitarist, classical/jazz bassist, and classical string quartet to create new musical fusions which set unique colors for this refreshing collection of Canadian and American poetry. Featured on the album is Carol’s song cycle “I Have Been a Traveller“, with poetry by Canadian Judith Miller. Relating to passages of time and seasons, including images of migrating Canada geese, raven, and white-tailed deer, “Traveller” is lyric, minimalist, jazz blues, avant garde, travelling from ocarino, Zimbabwean mbira, and African drums to singer, piano, electric guitar and bass. Also featured on the CD is “Houses,” a “mini-opera,” with poetry by American Shari Wagner, who writes playfully about houses and ghosts of her conservative Mennonite ancestors, and about three sisters who hide homemade necklaces under their dresses. As they “join hands and arms” to build “a house where they belong,” the sisters create new spaces for themselves while making peace with the past. The post-modern music ranges from neo-classic – representing cleanliness and order of tradition – to funk/jazz/fusion for the breaking out from this tradition. Carol and Cate premiered “Houses” at the 1997 American Mennonite Writers Conference at Goshen College, Indiana. It is the first concert piece ever composed about distinctive, “plain” Mennonite dress! “Little Creatures” is a musical setting of 10-year-old Chris Burkhart’s haunting poetry. Scored for vocals, cello, and piano,”West of Brutus” (text by Donna Burkhart) is where Chris is buried, and is the first art song about an Amish/ Mennonite graveyard. “Journey Just Begun” (text by Carol) is a tribute to her mother, Miriam L. Weaver. Performers on the CD include Canadian singer/songwriter Cate Friesen; Toronto guitarist, instrument builder, composer John Gzowski; American bassist Jeremy Kurtz; Toronto’s Modern (String) Quartet; and composer/pianist, Carol Ann Weaver. Her first CD DAUGHTER OF OLAPA – THE MUSIC OF CAROL ANN WEAVER travels from the frolic of a Canadian otter to the barking of a Kenyan Luo dog, spanning two continents – Canada and Africa The music is lyric/tonal, jazz-inspired, rhythmic, avant garde, minimalist, accessible to a wide range of listeners. The album features Ardeleana Trio, one of Canada’s leading new music ensembles, and Canadian singers Margaret Elligsen Hull and Nancy DeLong, along with pianist Carol Ann Weaver. Centrepiece on the album, “Daughter of Olapa,” scored for six performers, is based on traditional Kenyan legends about women. Composed in Kenya, 1992-93, it bristles with African tunes, and cross rhythms. “Olapa” means “moon” in Maa, the language of the Maasai, and is based on oral legends of the African woman. She is equal partner with the sun, but not afraid to show her wounds; she is over-worked wife who dies but her task-master husband loses many wives, daughters, and his pride; she pounds a dance out of millet for beer-making; she gives birth to a daughter who is the joy of her village; she is transformed from calabash to dog to beautiful woman; she is sacrificed and resurrected, saving her people from death and bringing them prosperity. She lives beyond us. “Olapa” contains continuous pulse, multiple layers of melody and rhythm, cyclic features, and is harmonically and rhythmically inspired by Kenyan popular music, featuring a constant benga beat and shifting, inner melodic/rhythmic patterns. No percussion is scored, but each performer’s role is highly rhythmic. Strands of a Soukous band (Zairian dance music) waft in and out of the music, as do Swahili coastal tunes, Afrobeat harmonies, and guitar-like riffs. “Massai Prayer” re-enacts a Maasai birth, witnessed on a hillside in Western Kenya where – surrounded by women, one of whom ties the cord with a piece of grass – the mother joins in the walking procession, minutes after the birth. “Otter Frolic” pays tribute to the Northern Ontario otter often found in Algonquin Park. Commissioned and premiered by Ardeleana Trio in 1988, it is accompanied by a playful, similarly-titled poem by Ontario poet, Judith Miller. • Mennonite Music & Women’s Music – the first solo CD by a Mennonite woman composer – ground-breaking! Mennonite-background artists represent a widely diversified, culturally significant group in North America, and are making an increasingly important impact on the arts today. All performers are women, & all poetic texts are by women, representing a woman’s perspective. • Poetry – contains the first musical settings of leading Canadian poet Di Brandt, also of Mennonite roots. A vivid, musically colourful, rhythmic/lyrical drama with poetic accounts of ancient, TIMBREL IN HER HAND showcases whimsical, fiercely strong, defiant Hebraic women icons, focusing on Miriam, the Prophetess, as found in the Old Testament – text by Judith Miller, set to music by CAW. Styles include song, rap, dance, spoken word, and instrumental pieces. In “Names Tangled Names” women’s names are lost in long lists of patriarchs, while “Tall Tall Tree,” Lyrically Beautiful Woman,” “Dancing” and others, show yearning, beauty, yearning and vibrant pulse. Margaret Hull, soprano; CAW, piano, keyboards; Lyle Friesen, mandolin; recorded, mixed, mastered by Gary Gini, at WLU electronic music studio., Waterloo, ON.